In my classroom I had a term reserved just for the students who scored 100% on a test or went above and beyond in their work. I called it Wowzer Work. The students were exceptionally proud if their work was displayed with a Wowzer.I would have the Wowzer workers stand up, put their hands in the air, and pat themselves on the back. One time, I gave a student a double Wowzer. After school that day, he brought his mother in to show it being displayed on the wall. 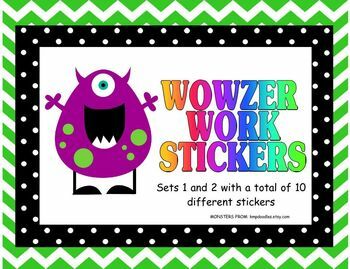 I have created stickers now of Wowzer Work and other complimentary sayings. I use the rectangular, 30 to a page labels that I get in my supply order from the district to run the stickers. The cute monsters are called monster clips, which I found and purchased online.